On a dark night in November, Meagan Patrick drove from her home in Acton with her husband, Ken, and their two children to a medicinal marijuana dispensary in Portland. Ken parked and went in, while Meagan and the kids waited in the car. “It was literally in a back alley,” said Meagan, a 31-year-old third-grade teacher. Just a few months ago, this errand – shopping for medicinal marijuana to treat her baby daughter’s epilepsy – would have been unfathomable. Ken came out empty-handed. There was plenty of medicinal marijuana available but, as they had suspected, not the kind they were seeking. So this Monday, Meagan plans to board a flight to Colorado with 13-month-old Addelyn – “Addy” – to begin the process of becoming a resident there, far from family, far from Ken’s job and their woodsy home in southwestern Maine but close to what she believes may be her best hope for her child’s future. About 100 families nationwide have already relocated to Colorado in order to obtain a strain of medical marijuana known as “Charlotte’s Web” that has been shown to be effective in treating children with epilepsy. Originally called “Hippie’s Disappointment” by its growers because of what it lacked in traditional potency, namely the THC (tetrahydrocannabinol) that gives users a psychoactive high, this strain of high CBD (cannabidiol) marijuana was renamed for a little girl named Charlotte Figi. Researchers at the University of Reading in England found evidence that cannabidiol, one of many components in the marijuana plant, can radically reduce the number of seizures in epilepsy patients; it reacts with receptors within the body and works as an anticonvulsant. That was borne out by Charlotte Figi’s case; at age 4 she was having 300 grand mal seizures a week and had run out of pharmaceutical options. In her first week on this cannabis-derived medicine she had just one seizure. Now 6, she is 99 percent seizure-free. In Maine, medical marijuana is legal, even for minors, provided they pass a certification process with the Department of Health and Human Services’ licensing board. But the nearly two dozen Maine families who want to try it have run into numerous roadblocks. The first is supply. Charlotte’s Web, developed by Colorado grower Josh Stanley and his five brothers – widely referred to as the Stanley brothers – is not technically available in Maine, as the Patricks found. But Charlotte’s Web rumors fly through this network of parents, many of whom originally connected on a private Facebook group called Maine Epilepsy Parents United. Some say there’s something just like it, or close enough, or that a Maine grower might be secretly working from a clone of the Stanleys’ plants. Others whisper that someone in California might be willing to mail another high CBD-strain to Maine. Or that maybe the high-CBD strain isn’t needed at all, that maybe the plant in its raw form could yield a medicine just as helpful. In this world where mothers ruefully count up the number of pharmaceutical options that haven’t worked on their kids and dread the possible side effects of whatever comes next, nothing seems certain but the desire to give a natural product a try. The second major obstacle is legality. It’s not as simple as going to Colorado to pick up some clones of the Stanleys’ plants and bring them back to grow in Maine. Under federal law, marijuana is still illegal and classified as a Schedule 1 drug without any known medical benefits and with potential for addiction and abuse; it’s in the same category as heroin and LSD. Anyone who imports it across state lines risks being charged with drug trafficking. 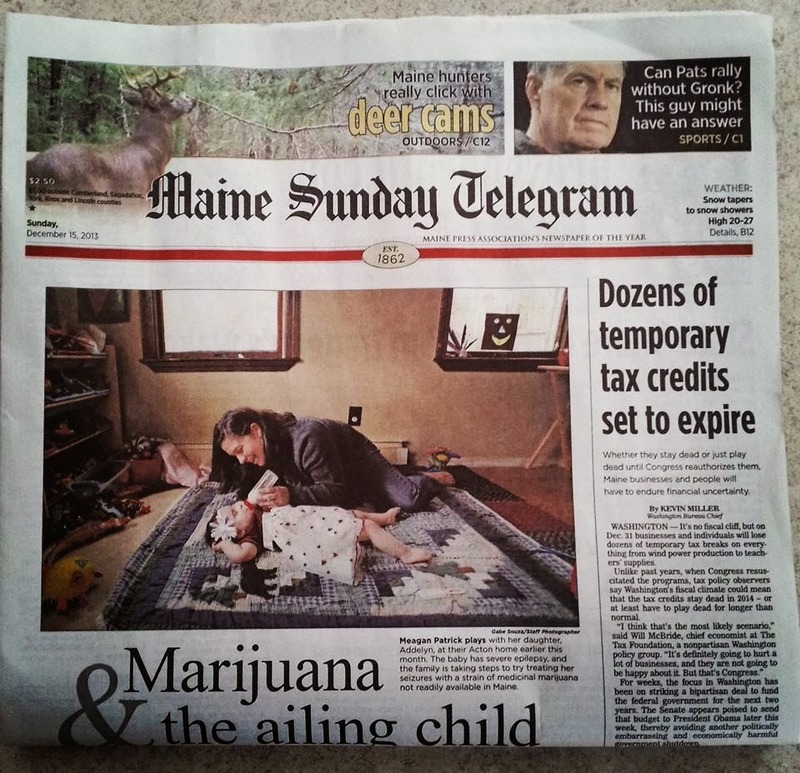 Even if a Maine family can obtain something similar – growers in Maine are working on high-CBD, low-THC strains right now – many of these children regularly cross state lines for doctor’s appointments at Boston Children’s Hospital or Massachusetts General. Their medicine has to go with them. As Joan Smyrski of Maine’s Division of Licensing and Regulatory Services for medicinal marijuana points out, that’s a lawbreaker.